Pat Collins and the Onion Fair Fairs had been very popular from 1529, two being held annually, the Pleasure Fair and the Onion fair. Much of the town centre was taken over by the festivities, theatrical booths, fun fairs and menageries. However the nineteenth century brought a move against such frivolity and in 1861 the fairs were limited to the Bull Ring area, and they were excluded from the town altogether fourteen years later. Showell's dictionary comments. These fairs were doubtless at one time of great importance, but the introduction of railways did away with seven-tenths of their utility and the remainder was a lot more nuisance than profit. Though Pat Collins is to us "The Onion Fair" we must not forget the other people who also did much to create these amusements, fairs, and keeps the traditions going strong. They are as follows, Arnold Brothers, Alf Ball, The Bidall Family, George Green, The Holland family, William Taylor, Charles Thurston, Randall Williams and Pat Collins family who continued after Pat Collins death. 8th December 1943 at is home Limetree house, Bloxwich, Walsall. 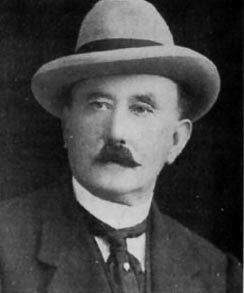 Aged 84 born 12th May 1859, Chester. 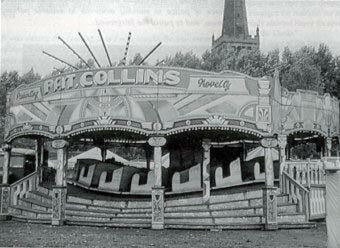 Pat Collins was one of many funfair proprietors involved in and around the Midland area but is name still remains synonymous with the Onion Fair. 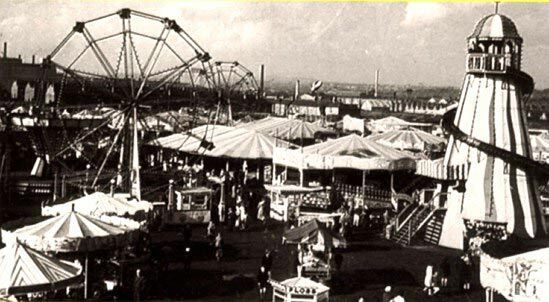 The Onion fair we all enjoyed at the Serpentine grounds Aston, first started out as a trading fair called the Michaelmas Market in the Bull Ring Birmingham, mainly retailing goods with some small amusements to liven things up. 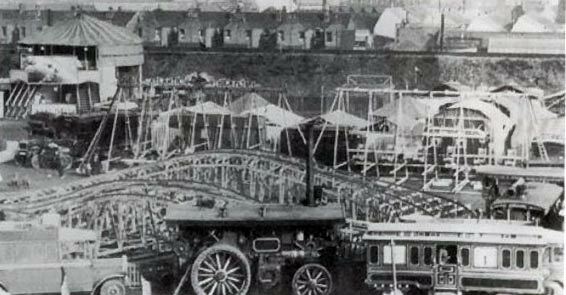 Due to the trader's animosity towards the amusements, they said it encouraged vagabonds and robbers mainly pickpockets to the area and by 1860 things had got worse where as the traders and businessmen said they did not mind the horse dealers and onion sellers and tried to get bylaws to get rid of the showmen and their amusements. By 1875 the Birmingham traders got their way and the show people moved to The Pleck, we know this area as Burbury Street Park before finally moving to the Serpentine Grounds behind Aston Parish church. September 1899 it was finally cornered in the Aston Brook culvert between Stevens Street and Bracebridge Street and Elkington Street, it had been discovered by its roaring. They gained access to the Brook through manhole covers at either end of the culvert and managed to capture it and return it to its cage. The Brook must have been not so deep as we knew as kids, it was good forty to fifty feet from the road and quite a climb. There was also a report of a lion escaping at a later date, 1924, while the Onion fair was at the Serpentine, it's name was Nero they used football nets from Aston Villa Foot ball club and the enticed it with big chunks of meat and Nero was captured by throwing the nets over him. 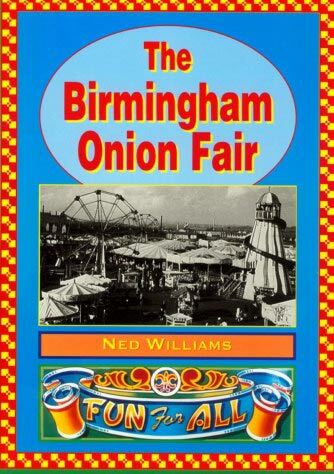 Though it was still called The Onion fair once they moved from the Bull Ring they never sold onions it was a name that that became synonymous with the fair. 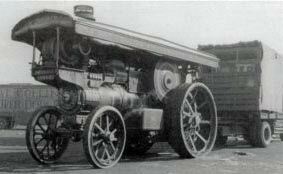 At first the attractions were driven by steam power with those big powerful road steam engines. 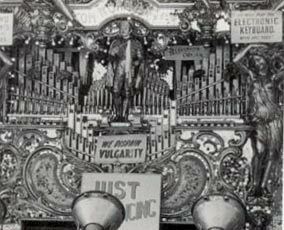 With a mounted generator to power all the lights, the lights were there to attract the public with their bright coloured bulbs, flashing and adding to the noise and excitement of all the different rides and amusements. The Ghost train, The Wall of Death, Waltzer's, The Dodgem's, The Big Wheel and many more plus all the side stalls with their owners shouting out roll up d roll up come on have a go. The Onion fair was always packed to capacity the crowds adding to the experience of wonderful times spent at Pat Collins Onion fair. This is just a brief summary of our onion fair at the Serpentine grounds Aston I have my own memories of the fairs over the years, helping with the stalls and getting free rides, standing in awe at the boxing booth. The wall of death not quite understanding how the motor bikes could stay up in the air listening to the screams emitting from the ghost train, but mainly it was the noise, the smells, and the thronging crowds. You could hear the fair long before you arrived at the Serpentine walking down Park road. And the downside trying to explain to parents why you were late getting home, yes many memories why don't you share yours with us we so can expand this story. This is a fascinating story I fully recommend it the pictures will bring back many memories I promise. Details will follow shortly on how you can purchase this superb book. Many thanks to Ned Williams with his help and kind permission to use a few of the photographs, we also think the National Fair Archives deserve a mention. I remember the Onion Fair well. I always used to love those bonnets with a plastic type edging with words written on like Kiss me quick. Being only a very young girl at the time I have to add I always used to nag my mum for one and if lucky would wear it with great pride. One evening when visiting the fair my dad and brother decided to have a go on the Ghost Train. Off they went with my mum, me and my sisters standing waiting for their re-appearance. To my mums consternation I insisted that my dad had been on one of the empty cars that came around out of the tunnel. Everyone panicked me most of all and the train was held up as mum ran in to find out where dad had dissappeared to. Suddenley from out the tunnel there came my dad and brother laughing and obviousley very ok. To this day I remember it with horror. When taken on the Ghost Train by my dad just to prove that it was only a fun thing I kept my eyes closed from start to finish. Later as I grew older I loved the Waltzers, and could be found hanging around there most of the time listening to the great music that they used to play, which seemed to attract all the best boys I thought. The Serpentine Ground, next to and behind Aston Parish Church ? The cost of a ride was 6d ! I first tasted Candy Floss there and rememeber being very hesitant about going into the side-shows, which boasted "Sword Swallowers", "Fire Eaters", "The Largest Rat" and a "Two-Headed Baby". Then there was the Boxing side-show where "would be" Johnny Prescotts could go a couple of rounds in the hope of winning ten bob ! I never did go on the Big Wheel or the Dive Bomb, but stuck to the old Helter-Skelter, The Waltzers, The Dodgems and the Jets. I was on leave from my national service and had been to the onion fair with my wife, we were walking home and I put my hand behind me and took hold of hers. we'd walked a few paces and I turned to look at her and found a young lady who was not my wife grinning at me, talk about red faced. It was a brilliant evening out at the onion fair, lots of atmosphere. The rides were a tanner most of the time, but if two of you got in a bumper car, some of the ride helpers would try to charge you a bob. We used to pick up the spent .22 cartridge cases, and use them as whistles. Going to the fair was also an oppurtunity to hang around with a few girls, especially if you could get them on the ghost train! I have a tale to tell. My mother, was persuaded by her mother in law, my grandma, to go with her to the fair. Now my grandma was as round as she was tall, according to my mom. So it was with some trepidation that they started out. My gran used to like a tipple, and my mom was worried that once they had been to the fair, she would want to call in all the pubs on the way home ; which was Tower Road Aston. How wrong could she have been? This was before I was born, so I am relaying my mom's story. It seems that hardly had they got to the fair, then pandemonium broke out, and everybody started running towards them, picture the scene, one very frightened little woman (my mom) and one very old lady, who could hardly put one foot in front of the other, a weight watchers nightmare, so they turned and ran leading the panicking crowd. And it would seem, that most of the crowd overtook them, and then with one voice and accord turned back on my mom and gran, as the poor old lion by this time had beaten the crowd and was now chasing them in the opposite direction. That night was certainly ingrained in mother's memory, and it was probably the only anecdote that she ever told with any certainty.